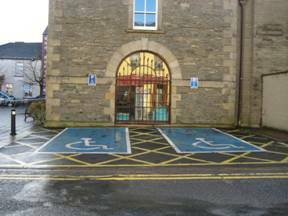 Bailieborough Library is a fully accessible building with a wide variety of library services available to all. Membership is free and anyone can join. The range of book stock is great but people don’t visit Bailieborough library just to borrow books! Many visit to read newspapers and magazines, for free Internet access, to work and do their homework or just to meet up with friends. Information and reference services are in heavy demand. The Arts Space is used for a yearly events programme which includes exhibitions, story telling, writer visits, workshops and reading group meetings – there is always something going on so check it out! 2 Accessible parking bays located at the right hand side of the building. The bays are painted blue and have signage clearly displayed. The main entrance has level access and automatic doors. The reception desk is accessible for both customers and staff. There is a lift from Ground to First Floor. Assistive and adaptive technology is available including a Magnifier Reader & Zoomtext Technology which is invaluable for people with visual impairment. Please contact library staff to find out about demonstration events and assistance. 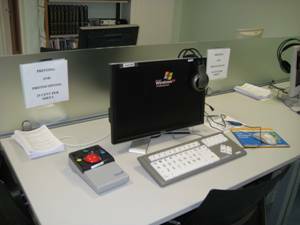 One PC is fitted with a large key pad and roller ball mouse. A packed events programme is offered in the accessible Arts Space. You won’t find a better, more up to date range of quality children’s and adult’s stock both for loan and for reference. Online services include Ordnance Survey maps, Britannica Online and Irish Emigration Database. Bailieborough Library is delighted to work with the HSE on the Bibliotherapy project. This project aims to promote mental health by recommending and making available quality self help books to enable people to help themselves. The books on the scheme were selected from recommendations made by doctors, psychologists and therapists and are now all available from Bailieborough Library.